George Faber declares the original name of Jesus was Jescua Hammassiah. Godfrey Higgins has discovered two references, one in the Midrashjoheleth and the other in the Abodazara [early Jewish commentaries on the Scriptures], to the effect that the surname of Joseph’s family was Panther, for in both of these works it is stated that a man was healed “in the name of Jesus ben Panther." The name Panther establishes a direct connection between Jesus and Bacchus who was nursed by panthers and is sometimes depicted riding either on one of these animals or in a chariot drawn by them. The skin of the panther was also sacred in certain of the Egyptian initiatory ceremonials. The monogram IHS now interpreted to mean Iesus Hominum Salvator [Jesus Savior of Men], is another direct link between the Christian and the Bacchic rites. IHS is derived from Greek which as its numerical value 608 signifies, is emblematic of the sun and constituted the sacred and concealed name of Bacchus. [See The Celtic Druids, by Godfrey Higgins.] The question arises, Was early Roman Christianity confused with the worship of Bacchus because of the numerous parallelisms in the two faiths? If the affirmative can be proved, many hitherto incomprehensible enigmas of the New Testament will be solved. Physiologus wrote, that the panther was a great friend of all animals with the exception of the dragon (symbol of evil). Physiologus continued and explained how the panther slept in its den for three days (like Christ in the grave); then rose, howled and released from his mouth an immensely sweet scent, that lured all the animals to follow him so he could embrace them. The panther therefore symbolized Christ and his resurrection as well as the spreading of the good word announced in the Gospel (the sweet scent), so that mankind should follow it. The symbol of the panther is thousands of years old. It can be found on pictures in caverns from Stone Age and later in all early cultures from Asia Minor to Egypt and Greece. In Greek mythology, it is depicted together with the god Dionysius. Later, it appeared in the Roman Bachus, and with them it spread over all Mediterranean countries during the ancient times. In early Christianity, the writer Physiologus from Alexandria used the image of a panther in his book about animals, as a symbol for the Gospel diffusion. The idea was that the panther diffuses a sweet scent (which was a symbol of the Gospel), and animals that follow this scent are also caught by it. His only enemy was a dragon (a symbol of evil). principles of loyalty, and the code of honor. See King Arthur and the Knights of the Round Table, and The Holy Grail. Poetry: Alfred Tennyson arranged his twelve Arthurian poems to describe a life cycle that corresponded with the cycle of seasons, the early tales of hope and promise set in spring, the stories of sensuality and passion in summer, the sagas of decay and decline in autumn, and the completion in barren winter. He framed the poems with a "Dedication" to Prince Albert, written in commemoration of his death in 1861, and the epilogue "To the Queen," written in 1872, underscoring the work’s national significance. ARGENT The French word for silver, of which metal all white fields or charges are supposed to consist. AZURE The French word for blue: it is represented in heraldic engraving by parallel lines, horizontally. BEND. One of the honourable ordinaries formed by two diagonal lines drawn from the dexter chief to the sinister base; it generally occupies a fifth part of the shield if uncharged, but if charged, one-third. CANTON. The French word for corner. It is a small square figure, generally placed at the dexter chief of the shield. When it is charged the size may be increased. It is said to represent the banner of the ancient knights banneret. DOVE The Tallow Chandlers of London had a grant in 1456 of Six pieces azure and silver with three doves in the azure each with an olive sprig in her beak. ENSIGNED. This word, in heraldic description, means having some charge placed above. FIMBRIATED. An ordinary having a narrow border of a different tincture is said to be fimbriated. GULES. Signifies red. It is represented in engraving by lines running parallel with each other, from the chief to the base. HARP National Arms of Ireland. The traditional and well-known arms of Ireland are Azure a harp or (gold harp on blue field). Generally known as the Brian Bó Rúadh harp, for a famous Irish king, who died in 1014. It is located in the Trinity college library in Dublin. KING ARTHUR'S FULL ARMS. Late French style: Azure, thirteen crowns Or; crest a dragon Or issuant from a crown; mantlings: parry azure and Or, lined ermine; supporters; two white greyhounds collared gules; motto: "Pendragon." The greyhounds are probably borrowed from the arms of the contemporary king of England, Henry VII. 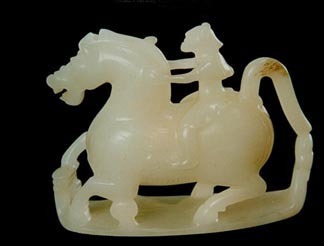 KNIGHT A title of honour conferred upon a subject for eminent services performed in war. In the course of time, knights who had gained riches and high titles formed societies under the control and direction of their monarchs in every part of Europe. MANTLE A long robe or cloak of state. MERCURY The name of the planet, used by ancient heralds to describe purple in blazoning the arms of sovereigns. MIDDLE-EARTH Emblems and Heraldry. Elves, Men, Dwarves, and even Maiar in Middle-earth are all known to have used emblems, arms and heraldic devices of various kinds. OAK Trees and Plants have been widely used through the ages as charges on shields. For Trees, the Oak tree appears to be the most widely used in the tree category. Illustrations of trees and plants on a shield. OR The French word for gold. This tincture is denoted in engraving by small points. ORLE Is a perforated inescutcheon composed of double lines going round the shield at some distance from its edge; it is half the width of the bordure. PALE One of the honourable ordinaries formed by two perpendicular lines drawn from the base to the chief. The pale occupies one-third of the shield. PHOENIX A coat of arms representing the city of Cirencester, England. go to Phoenix navigation. SALTIRE One of the honourable ordinaries, by Scottish heralds called St. Andrew’s Cross, being a representation of the cross of his martyrdom. It is formed of two bands crossed diagonally in the form of the letter X. If uncharged it occupies one-fifth of the shield, if charged one-third. SHIELD Lozenge Shield: The escutcheons of maiden ladies and widows are painted on a lozenge-shaped shield. Pointed Shield: The Norman pointed shield is generally used in Heraldic paintings in ecclesiastical buildings. Shield, heater: The best known heraldic shield is that called the heater-shaped, a type common during the thirteenth and fourteenth centuries. Tourament Shield: A tournament shield - heraldry, defence. SIR GAWAIN Sir Gawain's shield: Gules, a pentagle Or. Arms of Sir Sawain: Purpure, a double-headed eagle Or. SIR LANCELOT DU LAC: Argent, three bends Gules. The grace and purity of the swan were emblematic of the spiritual grace and purity of the initiate. This bird also represented the Mysteries which unfolded these qualities in humanity. This explains the allegories of the gods [the secret wisdom] incarnating in the body of a swan [the initiate]. WASHINGTON FAMILY COAT OF ARMS The Coat of Arms of George Washington's family. It is said to be in inspiration of the stars and stripes on the flag of the United States. .... Numerous instances may be found, either in stained glass, monumental brasses, or illuminated genealogies, of female figures bearing heraldic devices on their apparel. A married lady or widow had her paternal arms emblazoned upon the fore part of her vest, which by ancient writers is called the kirtle, and the arms of the husband on the mantle, being the outer and most costly garment, and therefore deemed the most honourable. This is called bearing arms kirtle and mantle. .... The harp, now used to represent Ireland, was first introduced into the royal arms at the Union of the Crowns in 1603. It had previously, however, appeared on the Irish coins of the Tudor sovereigns, which, before that time, had borne the three crowns in pale, which had been granted by Richard II. 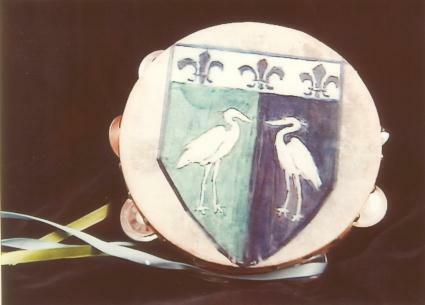 to Robert de Vere, Duke of Ireland, as an augmentation to his arms. It was also carried at the funeral of Queen Elizabeth as the banner of Ireland. The Illustrated Chronicles of Matthew Paris Observations of Thirteenth-Century Life: translated, edited and with an introduction by Richard Vaughan; illustrations selected by Nigel Wilkins; photography by Ian Cannell. The two metals of heraldry are gold [OR] and silver [ARGENT]. Gold is represented by yellow, silver by white. Metallic colours are not used alongside white and yellow on the same achievement. Steel helmets are depicted as gray. The traditional heraldic colours are: red [gules], blue [azure], green [vert], purple [purpure], and black [sable]. Additional colours are sometimes used, but considered untraditional: orange or tawny, dark red, and sky-blue. by perpendicular lines from the chief. Sanguine is dark red, or murrey colour: it is represented by diagonal lines crossing each other. Furs are worn by royalty and peers - garments of state that denote dignity. They are sometimes used on the shield as decoration. as of the Third Crusade  hereditary decorations of weapons of warfare were in existence. As Raglan Castle heraldry demonstrates within the Herbert family coat-of-arms, there is clearly a combined English and French heraldry entering the mainstream in Europe at this point. Construction of the Raglan Castle we know today began around 1430, according to historical records about the castle's many stages of development. The Herbertorum Prosapia shows the Herbert arms halved with those of the Gam family at the time. Aside from the heraldry factor, keep St. Joan of Arc in mind. 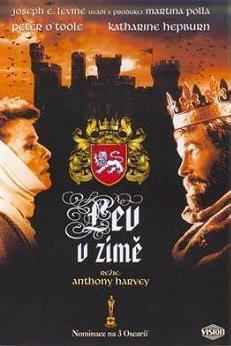 Her 5/30/1431 "trial"
Katharine Hepburn as Eleanor of Aquitaine in, The Lion in Winter [comparison w/Hillary Clinton]. "It did not matter whether certain animals existed; what did matter was what they meant." [some 5 feet 4 inches long] is very similar to Anduril, the sword of Aragorn. Faramir: "Where does my allegiance lie, if not here?" Winchester Castle, Hampshire The Great Hall and Round Table, on the wall: first and finest of all 13th century halls, with the greatest symbol of medieval mythology, The Round Table of King Arthur. The destruction of the fellowship of the Round Table, and the death of Arthur, may be described in the Annales Cambriae [the Annals of Wales], which refers to the 'battle of Camlann, where Arthur and Medraut fell'. 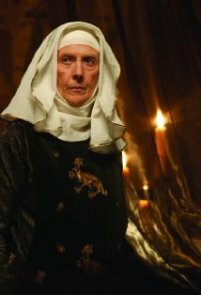 Medraut [Mordred] is sometimes portrayed as Arthur's own kin, but always an incarnation of evil: to defeat him, Arthur must sacrifice himself. Heraldry in film is essential if the audience is to intuitively embrace the energy of the story and each individual as development of the character advances during a movie. Films with heraldry as key to a storyline: Braveheart, 'First Knight', 'The Lion In Winter', and Indiana Jones and the Last Crusade - these films provide memory of lost chords. They can be overwhelming reminders of the common bond for our waking consciousness. Tolkien's fantasy is so vivid, both for written page and silver screen, because everything he created is part of old Europe. Films with that resonance of common ancestry are usually listed as favorites by all age groups, in part due to authentic historical legacies we share. Tolkien drew from Norse legends as well. His wizards reveal characteristics akin to Odin, the Norse god, believed to have fashioned the universe, created man and established the laws that controlled the destiny of the world. 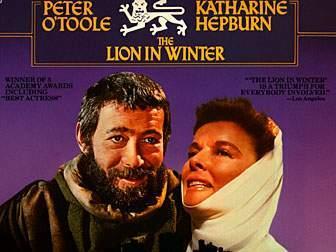 Click 'Lion In Winter' poster above for Katharine Hepburn fanpage. 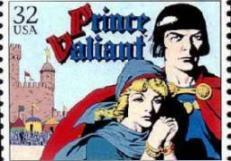 Prince Valiant and Queen Aleta, figures from the Arthurian Legend, became an integral part of American life. They appeared the Sunday paper each week for decades. After several years, the comic strip eventually inspired a film with Robert Wagner, Janet Leigh, and James Mason. Most Tarot decks of the Middle Ages show the city of the artist or his patron as a backdrop model for New Jerusalem, Tarot Trump XXI. The Visconti Tarot is a classic 'old school' image with geometric design for the victorious soul. Well known decks created a blend of the inner mysteries and ideas atmospherically current at the time of the artist's rendering. Cards were painted with the background, theme or sub-text point of centre based on the collective consciousness where the deck was produced. Biblical verse, a common association, is found in the Book of Revelations, Chapter 21. See the Twelve Tribes of Israel Banners. Symbols go back to Moses, the Lawgiver [at least] because the camp formed a circle with the Ark of the Covenent in the centre. Several films in the sci-fi genre refer to the suggestion of New Jerusalem, as the 'last human city' Zion, in The Matrix trilogy, and the futuristic world in the supernatural Nicolas Cage thriller, Knowing. 'The Last Valley' [and other gems from Michael Caine] and 'Brigadoon' angle the vision of Trump XXI so the city represents promise of the triumphant soul with an infusion of intense energy directly pertaining to the story being told. "The wall was built of diamond, and the city of pure gold, like polished glass." EL CID is Spain's patron saint. 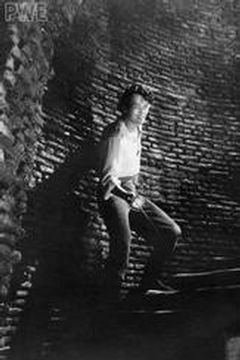 The film picks up his story in the year 1043, when El Cid (Charleton Heston) takes a 'short cut' to meet his bride (Sophia Loren) and rescues a mission under attack by a Morrish warlord, Ben Yussef (Herbert Lom) - a pivotal moment in life follows. El Cid is moved by spirit to free the dreaded Moors he overcomes in battle, gaining their oath to never attack Castile. In the process he wins the allies needed to overcome a far greater threat to Europe. By extension, the ever-popular, effervescent book turned stage play, turned flick-fave 'Finian's Rainbow' (Fred Astaire's last film) leads to the rainbow's end and heart of gold. Tagline: If all you want out of a movie is a great, big, wonderful time - just follow the rainbow - whistle the songs - and join in the fun. Welsh heraldry is prominent in Zeppelin cult classic, 'The Song Remains The Same' ~ so full of symbols, mystic signs, portents and cosmic forces, it should be analyzed as evolving life form rather than a movie. This page has been visited more than a gazillion times.